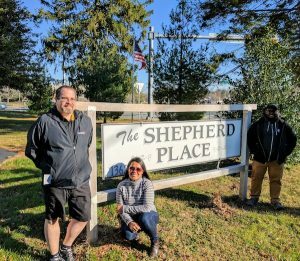 This holiday season SUMURI team members volunteered to help out a local shelter known as The Shepherd Place located in Dover, Delaware just a few miles from SUMURI headquarters. The Shepherd Place provides emergency housing to single female adults and their children who are temporarily displaced or homeless. The Shepherd Place provides housing, food and protection for these women and their children during their stay. SUMURI and its team adopted and provided gifts for this holiday season for ten children whose ages ranged from three to eleven and one mom. 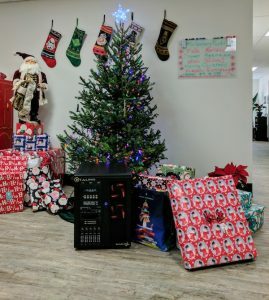 The presents that were donated by SUMURI team members were delivered by Ailyn Whalen (SUMURI President), Jason Roselewicz (Senior Manager TALINO Division) and Joe Smith (TALINO Hardware Engineer) on December 22, 2016. SUMURI would like to acknowledge Tabitha Forren (TALINO Team Lead) for her dedication and efforts to coordinate this event!